The muscles along the side of the abdomen are called the obliques, which are in charge of movements involving side curving and waist twisting. Exercising the obliques helps fasten your waist and compress your midriff. Complement your workout routine with the following 10 waist trimming exercises to have a achieve a smaller girth. When dong bicycle crunches, you can simultaneously work both your abs and obliques. Plus, your body can be kept in continual movement, which raises your hear rate and provides you a great cardio boost. With the complementation of the dumbbell side bends to your workout schedule, both your internal and external obliques can be activated and shaped. By adding the heel touchers to your daily workout, you can compress the complete side abdominal wall and fasten your waist, thereby achieving a hourglass-shaped body. The oblique V crunch fully targets your midsection and the obliques, compresses the core, supports the back, develops balance and adaptability. Doing russian twists, you can target your core and work the muscles around your midsection, support your lower back. Moreover, your balance, stability and posture can also be improved. With plank hip dips, which is modified from the elbow plank with the addition of hip rotation, your midsection can be further targeted. Plus, your obliques, abs and lower backs can be strengthened. This exercise is ideal for engaging the abdominal muscles and the obliques, compressing and tightening your midsection. Furthermore, you can fasten your waist, make the abdomen more stronger and increase your balance and flexibility. With the side crunches, you can work both the external and internal obliques and shape your core, thereby achieving an hourglass-shaped body. This move is perfect for activating the obliques and improving durability and midsection strength. It fully engages the abs and compresses the waistline. The complementation of cardio moves, like the waist slimmer squat is necessary. This move does not only support your midsection but raises your heart rate to a great degree as well, which helps increase the amount of calories burnt and helps repair the waistline. Warm up your core before working the obliques. Do a core stretching to end your workout. Do cardio workouts for no less than 3 times/week, 30 minutes/time. Complement your weekly workout routine with upper, mid and lower body exercises. Eat a healthy diet and drink a lot of water during the day. 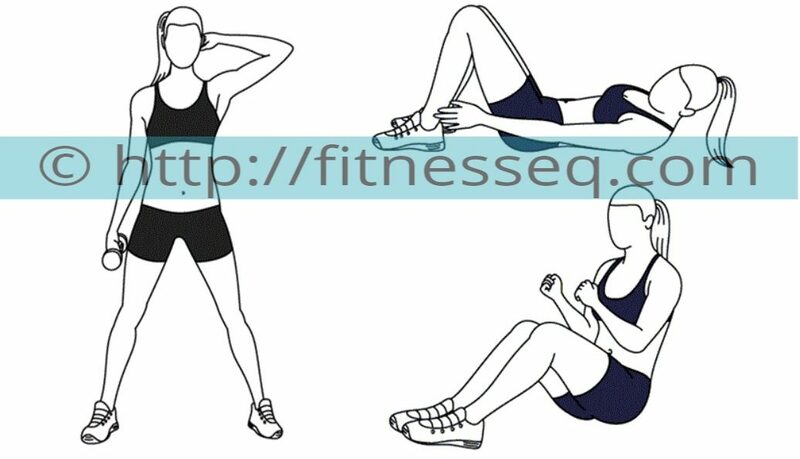 Above are 10 waist trimming exercises and some tips for you to work the obliques. Add them to your workout schedule and you will obtain an hourglass-shaped body.